All meals come with Baked Potato and Green Beans wrapped in Turkey Bacon. Included: Rolls, butter, salad, water, iced tea and lemonade services. Dessert: Chocolate and Key Lime Mousse served in a martini glass. All others will be served what's available (this is limited until meals run out). Here's a sneak peak at some of the door prizes which include gift certificates, gift baskets, Jewelry, electronics devices, etc (just to name a few) and much more. 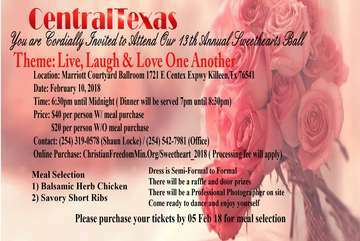 *Proceeds from this event will go towards the support of local and outreach charities such as the Cove Soup Kitchen of Copperas Cove, the Cove House Homeless Shelter, the Hill Country Retirement Center of Copperas Cove, Youth Scholarship Programs, Philippines and Kenya Missionary teams and other programs for community improvement and those in need.